Did you know that over seventy-five percent of New Year’s resolutions fail? Often times we create New Year’s resolutions that we are capable of achieving but it is usually our mind set that holds us back from sticking to or maintaining them for the year. We may have the best of intentions and motivation to achieve what we set out to do, but often one set back, slip up, or cheat and we completely give up. New Year’s resolutions, just like goals, need to be created with the understanding that there will be setbacks and mishaps along the way, it is not a linear process and it takes time. Instead of thinking “I messed up, why bother to keep going?” or “this is taking too long, why bother?,” we should be thinking “trust the process and timing, I will get there, I can do this.” With a few tweaks in how we create New Year’s resolutions and our mindset about them, we can achieve one hundred percent success. Set realistic and obtainable goals. Many times we start the new year with very ambitious hopes and ideas of what we want to and think we can achieve in the coming year. It is great to have high expectations and want to be successful, but if our New Year’s resolutions are not realistic or obtainable, we are setting ourselves up for failure from the very beginning. Say for example your New Year’s resolution is to pay off all your debt and loans. Depending on your financial situation and amount of debt or loans you have, this could be realistic. However, if you know that you are only able to make just above the minimum payments and could realistically cut the total in half by the end of the year if you stick to a budget, then that should be your resolution. You can always raise the bar on your New Year’s resolution during the year if possible, but don’t set yourself up for failure and get discouraged from the start. Think more realistic and obtainable rather than ideal or impractical. Be specific, or general, but find what works for you. 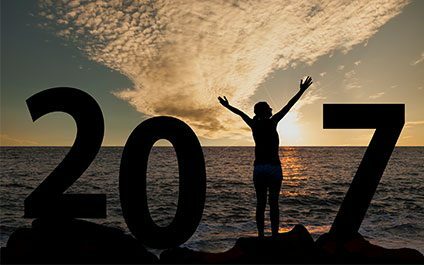 Some people do really well with setting New Year’s resolutions with very specific criteria or quantifiers, such as a specific number of times per week to do something or a set number to reach, and others do well with more general and open resolutions, such as to increase the overall frequency of doing something or to just decrease a number overall. Just because someone else sets a very specific resolution does not mean that will work for you, or vice versa. Knowing what will keep you motivated and able to stick to your resolution for the year is very important to determine before creating your New Year’s resolution. Don’t be all or nothing. When we have an all or nothing mind set about anything, and especially New Year’s resolutions, we are again setting ourselves up for failure. New Year’s resolutions, like goals, are going to have setbacks along the way, and that is okay. The important part is your mindset in the beginning and having an understanding and acceptance of the fact that there are going to be set backs, trials and errors, and times when you might want to give up or quit if things aren’t happening fast enough. Just make sure you remember that this is part of the process and you can still achieve your goal despite any negative thing that may happen along the way. Be flexible or reassess. The New Year’s resolution or resolutions you set at the beginning of the year are not set in stone or unable to be changed or altered. Achieving your New Year’s resolutions is a process, and part of that process is learning to be flexible and knowing when to reassess the situation and redefine or tweak the original resolution. Maybe the original resolution no longer is relevant, there are different ways to achieve it, or the parameters need to be altered. Whatever the case may be, it is important to go into the process with the mindset that anything can be changed, tweaked, or altered without the sense of failure. New Year’s resolutions are meant to have a positive impact or change in our lives and motivate us to do achieve them. Therapy can also be a great tool to assist in creating realistic and obtainable resolutions, to help achieve our New Year’s resolutions, to keep us accountable, and to help assess and understand setbacks and how to overcome them. Please contact Symmetry Counseling today to schedule an appointment with a therapist and get ready for a new year full of achieving your resolutions!